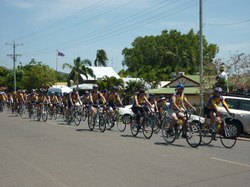 Every year, hundreds of cyclists from around Australia and overseas are drawn to the city of Cairns in tropical Far North Queensland to saddle up for the Cardiac Challenge. The three-day, 333-kilometre ride attracts people from all walks of life: teenagers, new mums and retirees, cabinet makers and accountants, doctors, nurses and dentists, farmers, foundry workers and pharmacists, pilots and school principals, lawyers, bus drivers and builders. Overseas and interstate participants, as well, appreciate the opportunity to experience the dramatically varying terrain of Far North Queensland in a very “up close and personal” way: from the leafy, sun-dappled Kuranda Range road, winding upwards through lush rainforest to the Atherton Tablelands, across rolling golden savannah lands and on to the shores of the sparkling Coral Sea at Cooktown.